It’s officially December, which means it’s officially fair game to get decorating for the holidays! Today we’ll be focusing our efforts on the centerpiece of the Christmas season – the tree! Holiday enthusiasts, read on for some inspiring new spins on your old tree. This tree’s neutral style suits spaces with a Scandinavian design; simplicity is what makes the tree so striking. Fragments of tinsel and white candles create a bit of sparkle while the faux fur tree skirt adds an element of warmth. Sometimes less is more! Although our love for red and green runs deep, it can be nice to soften things up with a blush pink. 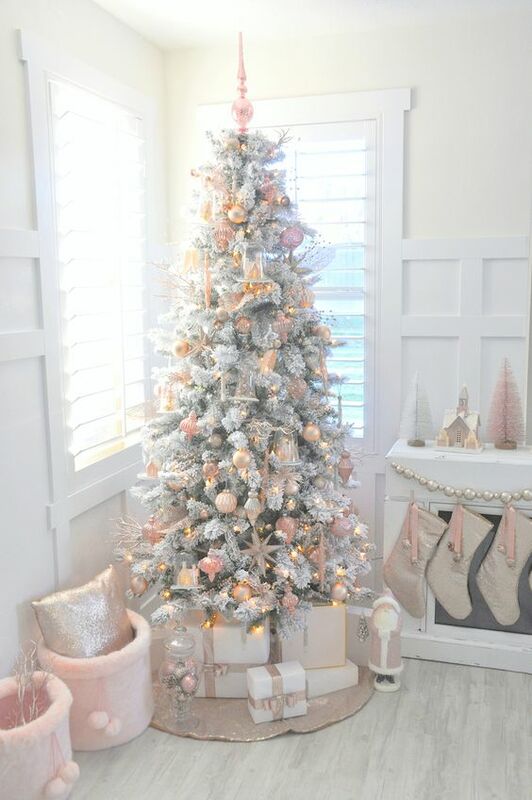 This light and bright combination is festive and feminine and goes beautifully with gold accents. The variety of shapes and sheens on this tree make a mesmerizing statement. The combination of gold and silver are extravagant and festive – great for those who like to pull out all the stops at Christmastime! This tree belongs on the set of The Nutcracker! Blue and silver glass ornaments look amazing on a snowy white tree. Tie in large blue ribbon for texture and hints of gold for that frosty winter look. This is an earthier, relaxed option for the laid-back country living room. Tie gold ribbon loosely around branches and string white beads casually below the tip of the tree, which you can adorn with antlers. Snowflakes, twine balls and mismatched decorations make for a truly charming display. Do you have a favourite tree from above? How do you decorate your tree each year? Do you change your design and decor each season?